Shop our extensive selection of 8', 10', 20', 30' Floor Standing Displays, Tabletop Displays, Island Displays, Monitor Kiosks, Retractable Banner Stands and Event Accessories, including Hard Shipping Cases and Carry bags. We work closely with our customers to design professional looking stock displays and custom exhibits to order. 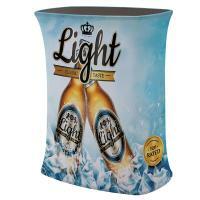 Our products are trade show tested and suitable for convention centers, retail displays, hospitals, universities, indoor / outdoor events and more. We offer Trade Show Displays and Exhibit Booths in all sizes and for every need! Whatever your budget, whatever your requirements, we have a solution for you! New World Case, Inc. offers Portable Trade Show Displays, Hybrid Display Systems, and Custom Trade Show Exhibit Booths in a wide variety of sizes and styles for every requirement! All our displays are available as you need them, either as hardware only or as complete kits. We also offer Custom Design Capabilities enabling us to work with new innovative materials and a variety of existing Display Systems to create a perfect selling scenario to help you make your events a success! Display Graphics, Lighting, Portable Literature Racks, and many more Trade Show Display Accessories are also available to complete and compliment your Convention Display's look! Replacement parts and Display Accessories for all Exhibit & Display Manufacturer's brands including Arise Pop Up Displays, Retractable Banner Stands and Banner Displays, ShowStyle Briefcase & ShowMax TableTop Displays, and many more! Located in Massachusetts, we serve customers in Connecticut, Rhode Island, New Hampshire, Maine, and Vermont, as well as all across the Country and Canada! No Sales Tax outside of Massachusetts!